Thank you for downloading AndroMouse 6.0. This is the place where you learn how to setup AndroMouse, download AndroMouse Server, ask questions and help others. 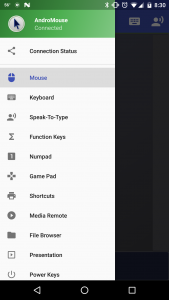 AndroMouse lets you convert your Android smartphone into a wireless mouse, keyboard, media remote, file browser and much more. Communication with your computer can be made using your WiFi network or using Bluetooth. AndroMouse features most mouse functionalities including click, double-click, drag and drop, scroll and right-click. 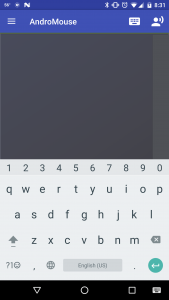 You can use your phone’s on-screen keyboard as the wireless keyboard. 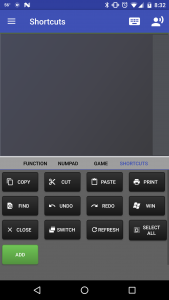 In addition to wireless mouse and keyboard, AndroMouse also provides tons of extra features. Most popular features include speak-to-type and file-browser. Relax on your couch and search Google or Youtube with your voice. Compose an email with your voice instead of using your physical keyboard!! Browse your computer files on your phone. Here is a sneak peek of what’s new in all new AndroMouse 6.3. What has changed since earlier versions? Basically everything! I published the first version of AndroMouse in 2011 – since then I had been updating/fixing few thing here and there without changing much of the core functionalities. To make the application and the server much more robust and to boost performance, I rewrote them again from scratch. Although everything underneath the application is brand new, the basic motivation of my hard work remains unchanged – to make the best performing wireless mouse and keyboard app. If you are familiar with earlier versions of AndroMouse, it should be fairly simple to get started. Please make sure that your app version and server version matches – current version is AndroMouse 6.3 (both app and the server). When you have made sure that Java runtime is installed, double click on the AndroMouse Server.jar file that you have just extracted and just like that the AndroMouse Server is running. Now we can use AndroMouse app on your phone to make a connection. Linux users – When trying to run the server you might get an error message with something like ‘.. the file is not marked as executable’. To fix this, right-click on the file and click on properties and on Permissions tab – make sure to check box ‘Allow executing file as program’ is selected. Mac Users – When trying to run the server for the first time you might get a message saying ‘the file cannot be opened because it is from an unidentified developer’. In that case, right-click on the server file and click on open. Windows Users – You might get a Windows security alert saying something like ‘Windows Firewall has blocked some features..’. 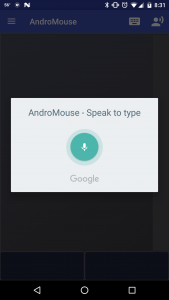 You must select ‘Allow Access’ to use AndroMouse. If you are still having issues connecting to the server, your AntiVirus software might be blocking connections – please open Java SE binary for incoming and outgoing connections on your Firewall settings. You will see the following screen when you successfully start the AndroMouse server. Now all you have to do is let it run and use your AndroMouse app in your phone to setup the connection. Note – Screenshots provided below are from the ad-free version. Click on the ‘new’ icon located on the title bar of the application. You will see the following screen that will let you choose either WiFi or Bluetooth (Bluetooth is only available on Windows for the time being). Select Wifi. Note – Please make sure that the computer and the Android device are connected to same the wifi network or hotspot. 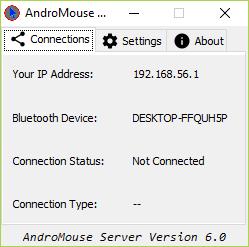 AndroMouse will automatically start detecting AndroMouse Server that is running on your computer connected to your wifi network, once found it will provide the server details and give you the option to start the connection. However, for some reason, if the app didn’t detect the server – you also have the option to enter the Server’s IP address manually to make the connection. Note – Please make sure that your phone is paired with the computer and Bluetooth is turned on. 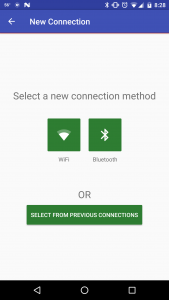 From the ‘New Connection’ screen – select Bluetooth. 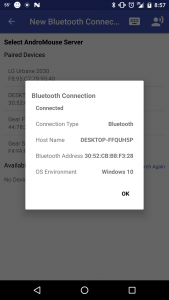 You will see a list of Bluetooth devices paired with your phone under ‘Paired Devices’. Select your computer to make the connection. After successful connection – you will notice that the thin horizontal bar below title bar turns green. Note – the color of the thin horizontal bar beneath the title bar indicates connection status – red for disconnected and green for connected. You will also feel a short vibration when your active connection gets disconnected. Move your single finger around the touchpad area as you would move a physical mouse over a mousepad. You can tap on the touchpad to send a click signal or use the mouse buttons below the touchpad to send respective click signals to your computer. Here is the list of various ways you can send signals using the touchpad, scroll bar and the mouse buttons. Tap on the ‘keyboard icon’ to bring up keyboard. Press on back soft-button to hide the keyboard. I have provided screenshot of each of the AndroMouse Extras and a short description underneath. If you feel like speaking instead of typing – use this feature. All your function keys and additional keyboard keys are provided here. Use game pad to use your phone as a wireless joystick. You can customize each button so that you can select what key you want to send when you click on that button. Use pre-existing shortcuts like copy, paste, print or create your own. 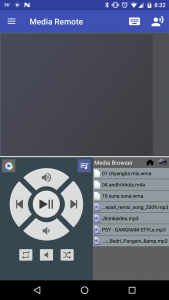 Remote to control the media player running on your computer. It also comes with mini file browser so you can browse your computer’s media files and select which ones to play. Browse your computer’s files from your phone, you can also send the signal to open the file in your computer from your phone. 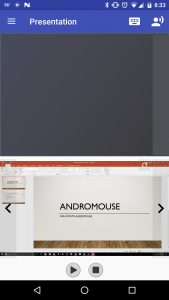 Control your Powerpoint presentation from your phone. You will also see your computer’s screen to make sure that you are on right slide (this function is currently in beta). Restart, shutdown, lock and put your computer to sleep from this remote. 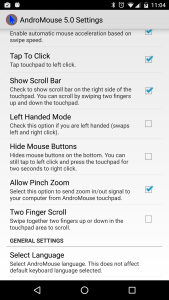 Many of the AndroMouse features are customizable via the settings screen. If you have a specific question on any of the setting item, please let me know in the comments below. I know there are a lot of things that I have not covered on this page, but should you have any question, comment or any suggestion for the future release, please let me know in the comments section. Thank you once again for downloading AndroMouse. I hope you will enjoy the app and give me positive review in the app store. Link to the app store. Will definitely try it on my laptop and phone! Thanks for this tutorial. Now, I can also control my PC from an Android device. I can move the pointer in the desktop but its showed as static in screen, I mean, when I move by the smartphone I can see how is resalting all the positions where my pointer is but the pointer icon still where I leave it with the mouse. Great, those screenshots made it look easier! Is there a way to run the server app as a service? I’d like to have this is the primary interface and the server app occasionally drops. Also, is it possible to have a custom keyboard automatically load as a default keyboard. Lastly, would like to have a sensitivity setting for the custom track pad object when used in a custom keyboard. Hello Suraj, Nice work. I’m trying to run the server on Ubuntu 16.04, but not able to get the device name : https://imgur.com/VavQFJt . I’ve already paired my phone with laptop. Also from the mobile app, using bluetooth , it’s not able to search for the server. Could you help ? Many thanks ! Will this work on a Chromebook? Didn’t see it specifically stated but was wondering i about any knowledge on an alternative or current or future development?? How can i use other language like bengali ? if prediction is on this system dosen’t work cause, it just send a charecter insted of sending word. Please make it compatible with utf-8 font & word stream. Thankyou in advance. Don’t know if this is the best place to report bugs, but the mouse wont move from the middle line of a 2 monitor setup? porque no se puede usar de ANDROID A ANDROID no veo ningun programa que se pueda, yo por ejemplo me gustaria escribir desde mi movil a mi E-reader, y los dos sistemas son android, has pensado alguna vez hacerlo compatible de algun modo, en verdad no veo ningun programa asi. Voice in put works though. I would like to buy it, but it is silly without keyboard. Please fix and let me know. Updated App to 6.4 and running 6.3 on Mac. Experiences disconnect after about 15 sec of connection. Reconnect then it does it again. Hi, I cannot get this to work. It looks like like an awesome app and would like to use it. I have the app on my phone and my phone is connected to bluetooth, sent one music file to verify that. I downloaded server and am able to open jar file, i have java 8 run time installed and opening jar file with it. Server is running and shows no bluetooth connection. If i go to new connection on phone app it doesn’t show my phone connected to my computer through bluetooth. I don’t want to use wifi because I use a hotspot off my phone as my only source of internet. Please advise to help me get this working. Will buy app if it works as good as expected. Thanks and please advise! With andromouse 6.4 the keyboard stopped working. Sometimes i can write some letters but never a whole word. Can i download andromouse 6.3 somewhere? Or will there be an updated server for 6.4 which maybe solves the Problem? Some more Infos: speak to type works. the problem with the keyboard is the same on wifi and bluetooth. hope youll find a solution i really liked your app and used it for years now. You have to deactivate the predictive text option in the keyboard settings of the android device. maybe you could put this in the faqs or sth. Strange thing is, it used to work with the predictive text option enabled. Will it work with a Chromebit ( chrome os device )? I can’t connect my lenovo android tab and my pc windows 10. On bluetooth: the two machines are coupled but the tab search and don’t found the pc. On wifi: even I enter manually the adress the tab knows the adress but doesn’t detect the pc. Of course the app is open on the pc. Hi. Does this app support funktions when I am in the login screen in windows? without option to (auto) hide server this is not useful for daily usage. 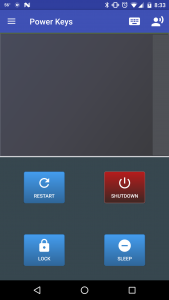 It would be cool if the server was available for android, so far I did not find such a phone to control the phone through a bluetooth smart TV. Everything else works, i think it a fantastic app. But how do you get the keyboard to work? Everything works on the keyboard except for the letters it self. Hello, great remote control but on Ubuntu 16.04 doesnt work power keys, any ideas? Have had for a long time paid version and has worked great until recently. Had it on sprint lg g4. Worked great then i got a g5 and was working great for a while but recently the keyboard wont work while i have mouse function. Is there an way to start AndroidMouse Server 6.3 minimized in the system tray? This is an excellent App. I have been looking for this kind of app remotely operate Tv with my phone. thanks for the awesome tips. Mental health specialist maintains gear of mental health clinics with administrative support, but more than that, they play an active role in the treatment and prevention of mental health crises. His duties include managing patient interviews and psychological tests, which provides personal and group consultation for psychological and substance abuse problems, and provides for physical needs of patients. Find psychotherapist and counselling in Leamington spa and Warwickshire. Hi there. I recently found your app and it worked fine for some time. However, after using some time, I’ve been facing an issue – my app frequently disconnects from the server. Sometimes the disconnection happens within a minute or so. I’m using Ubuntu 16.04 and latest update on android. Can I get some help on this? Also, a suggestion. a UI implementation of quick connect from previous connections on single click would be good. The user is anyway want to connect to recent connection if it selects it. Thank you for sharing it. Its useful information and i am gonna try this today for my Android box. Ubuntu 16.04, keyboard does not work more. This is a list of most downloaded applications that includes most of the free apps that have been downloaded many times for Android, iOS devices and windows mobiles. I just updated to the paid version and I no longer see my custom remote. Is there a way to get it back without re-creating it? 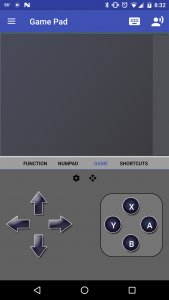 Currently, custom remotes are not saved, I am working on an update that will allow you to save custom remotes. I will pay for the ad free version when custom remotes can be transferred from free app to ad free version. This missing function should receive high priority since everything else seems to work on both versions. I do not want to start over remaking all my remotes. I will pay for the ad free version when custom remotes can be transferred from free app to ad free version. This missing function should receive high priority since everything else seems to work on both versions. I do not want to start over remaking all my remotes. I would have been very disappointed if I found this out after the refund period. You need to warn people of the lack of export/inport custom remote function. It obviously saves remotes so why not export/import? Hi. It will work for the opposite side? I want to control the android mouse from my linux pc. I have a Samsung Dex and i want to swap just my HDMI port of my monitor (to the dex one) and use an application to control the Samsung Dex keyboard and mouse from my pc keyboard and mouse. I really like your app and I have tested it on various computers and it works great. But now I have a problem with setup. I have internet via cable which goes into the Wi-Fi router and I have wireless internet in the flat. But I also have one desktop computer WITHOUT the WiFi card which is connected to the Wi-Fi router by an Ethernet cable. It serves as my media server. It runs Windows 10. I can run your Andromouse.jar on it but it is not seen by the smartphone app (because it looks for Wi-Fi, not LAN). How can I use your virtual mouse in such configuration? Any suggestions? I have downloaded the server files of andromouse so many times but i can’t run server. The properties of downloaded​ file is not appropriate. It opens itself in winRar. And doesn’t show any window. Please guide me how I can run server. I cannot find a way to make a custom action for the “Tab” keystroke. Is this possible? Other buttons like “Ctl”, “Shift”, and “Command” exist already. I am using AndroMouse 6.3 and it works great. 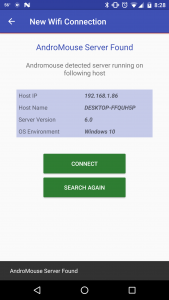 But recently I tried to create a hotspot in my phone and connected my linux device to that which worked fine but AndroMouse android app reported that it cant find any wifi network. Is there a workaround or would you be fixing this in a future update? Currently, the app does not support creating a hotspot. I am working on a fix. Could that hotspot also be a BT hotspot, as this would eliminate the need for WiFi connection completelly if BT is aivable? This is good app., But there are two problems. Keyboard in russian layout doesn’t work. I want to create my own mouse layout in custom remote and I wanna to use landscape orientation, but I can’t. I am looking into adding languages and landscape mode. I’ve been trying to download the andromouse server it keep on say invalid file ,pls any one who can help please do. the AndroMouse client available on Google Play is v6.4, updated on March 10, 2017. Can we use it with AndroMouse server v6.3? Keep up with the good work! Yes, you can use 6.3 server with the new client. I just instaledl ver 6.3 but found no response when writing Chinese character. The Android version is up to 6.4. When is the desktop one going to follow? Abdromouse works great! One question though – is there a way to start it minimized? Kevin, I will add that option in coming versions. The mouse pointer on both the mouse tab as a touch pad on a custom remote only moves horizontally. It sticks to the top of my screen. How can I solve this? “Drag & Drop” functionality does not work. Your website says: “Tap and hold on touchpad for two seconds” & then we are instructed to drag. But when I tap & hold, it does not do anything. I cannot select an item to drag. I am using this on Windows 8.1 with latest updates. Can you please investigate this? Jai, you can also hold mouse by long tapping on the left mouse button. Great app. I am using it on a OnePlus3 and Ubuntu. 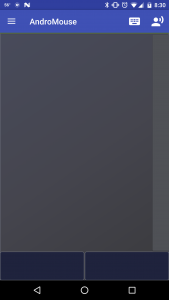 I would really appreciate a way to make a custom remote the default. I find that I am having to reselect the custom remote every time I come back to the app. Loren, thanks for the feedback. I will keep this in mind for next release. Pretty Cool app! I’ve tried it and works great with spa equipment. Needs some updates and easier config settings though! overall good ! You made some decent points there. I checked on the internet for more information about the issue and found most individuals will go along with your views on this web site. I use Ubuntu 16.04.1 LTS 64-bit. 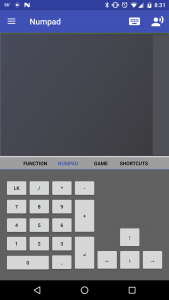 I downloaded the app for the numpad, because I have an Ultrabook but the numpad is working like a regular number input. 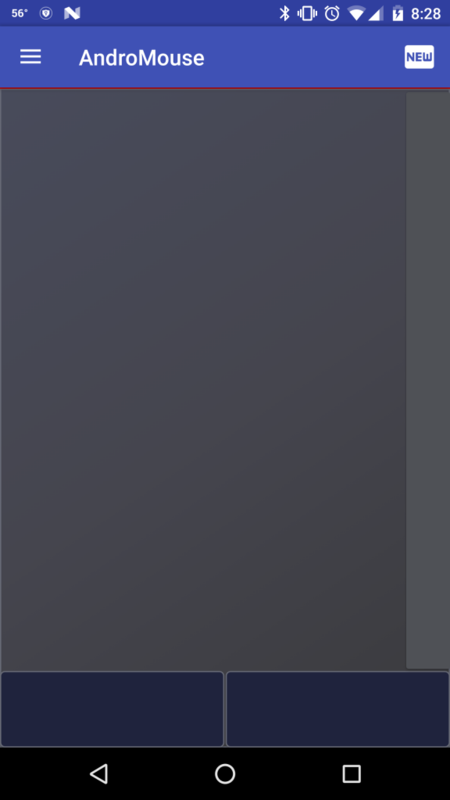 I want to use a numpad for use of Blender 3D to be able to change the view more easily. Same issue for me. Have you resolved this? Same problem here. Did it get fixed? How to i connect andromouse to my raspberry pi 3 ? First follow the instructions above (as for now : check if java is installed through “java –version”. On raspbian it IS the case. Download the file. Unpack the zip archive somewhere. Make the file executable (not sure it’s mandatory but I did it before trying). Then open a console, go to the directory where AndroMouse Server.jar is, and type “java -jar AndroMouse\ Server.jar” ot whatever name you gave to the file (please note if your definite begginer : ‘\ ‘ stands fot the space in a file name. I sugest removing the space in the name, I don’t like odd caracters in my command line). Now download AndroMouse on your phone, launch it, select a new connection, connect… and use. Thank you for reporting this issue. I will look into it and fix in coming update. 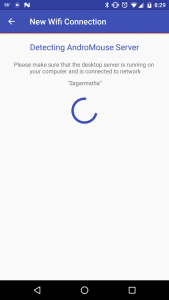 Hi Suraj, thanks for building an app that send to have a good robust easy to implement Bluetooth connection!! Tried various other possibilities and yours is the first that works for me. I do have some feedback – specifically to do with the function key and numpad screen options. I understand that you want to leave the trackpad option open, but my screen (zte Blade q Lux) is small enough that half of each function key is obscured, as are the 0 and . Keys on the numpad. I really need the numpad particularly, so if there’s any way to implement a “full screen” option, where you don’t have the option of a partial screen trackpad but do have full-size number keys, that would be amazing. Hope this feedback is useful. Hi Helen, Thank you for liking the app. 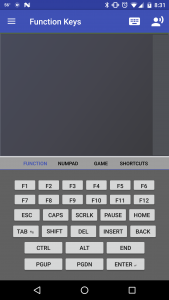 Next update will allow full-screen remotes so you can use all the keys. I will also be adding new features like the ability to create your own custom remote. Stay tuned. This is wonderful news!! Can’t wait – this is functionality I’ve been waiting for for ages!! Suraj, if you would kindly create an app similar to what you have done but that allows a Bluetooth mouse to work smoothly on an android phone. I wanted to use my phone as a computer with a TV as a monitor. So I purchased “ScreenBeamMini2” which functions perfectly in allowing you to view and hear whatever is on your phone on your TV without wires. I also purchased a Bluetooth keyboard and a Bluetooth mouse to use the phone as a computer and to allow me to use the USB-C port to maintain a charge on the phone. The keyboard works well with the phone. The mouse works well on a computer but not on the phone. On the phone, the mouse arrow has no lag but continues to move forward about 2 spaces after you stop the mouse on the mouse pad whether you use the mouse directly on your phone or on the TV. I figure it would be easy for you to find or create a driver you could install on your phone to make a handheld mouse work well and have good functionality on the phone. If you can make a mouse work well on the phone it will work equally as well using the TV as a Monitor with ScreenBeamMini2. Al, I am looking into this. Thanks. My wife has a nexus 5 running stock marshmallow unrooted and it does the same thing. Hi, I have the same problem. Two monitor, the primary on the right in a 2 desktop configuration. I have Ubuntu 14.04.5 LTS and the cursor on the computer is stuck on the right side of the screen. Works up and down but always stuck on the right side. The buttons work well. AndroidMouse Server 6.3 on Ubuntu. AndoidMouse 6.4 on the phone. Does it work to control another Android phone or tablet? Claus, Sorry for the bug. I will fix it in next update soon. hey i am facing serious connectivity issues i realy like v5 but this is disappointing me. please help. i loved this app since v2. the Bluetooth gets disconnected and then it doesn’t get connected so i have to close the app and start again. Could you help me to configure andromouse with bluetooth compatibility on fedora 24 please. Anti-Spam Quiz*: Which is colder, ice or steam?